Update 2018: I’ve used a bunch of new tools since I wrote this. I’ll be adding them to the list. This guide is aimed towards those who are planning on buying their first green woodworking tools. It can be difficult to find out what you should buy. You are often torn between three main, and often conflicting goals: you want to buy good tools, that are easy to come by, for cheap. With this guide I aim to give you some advice, keeping these three goals in mind. Sure, it would be easy to buy great tools with unlimited funds, but most of us are on a budget. And you can easily get cheap tools at your local DIY store, but they aren’t always the best buy. I’ll discuss a couple of different options, so you can decide whether you’re going for cheap and easy, going to save up for something more expensive, or perhaps that it would be better to go for a more challenging solution. The advice I give below is, of course, based on my own experience. I live in Europe, so it may be easier or harder to get certain items over here than it would be in, say, the United States. I haven’t tried out everything that’s available out there, so if you feel that I’ve missed some important products, feel free to tell me in the comments! Your two most important tools for carving spoons are your straight, or sloyd knife, and your curved, hook, or crook knife. I’ll discuss these knives first. Choosing a straight knife is actually pretty easy: the Mora 106 combines great value for money with excellent availability. I feel you actually can’t get a lot better knives than this. Sure, you can go fancier, but the 106 is hard to beat, performance-wise. I own a bunch of 106’s for teaching, and they are just wonderful. It comes with a very ugly, but very functional, plastic sheath. I use a different Mora knife myself. It’s a blade that you buy without a handle or a sheath, so it involves a bit more work. It’s a bit shorter than the 106, which I like, but otherwise it’s nearly identical. If you feel like making your own handle, I’d go for that one. From time to time people would ask me if this knife was any good to buy. This maker, Beaver Craft, sells his wares via Etsy (and I believe Amazon as well). He clearly tries to cater to the spoon carver market: he sells these “sloyd knives”, as well as a lot of different hook knives and “spoon carving sets”. The knife looked pretty decent on the picture and the price was even better: cheaper than a Mora 106. I decided to order one to see for myself if these were any good. The knife I was sent looked a bit different from the one in the etsy ad. I was a bit disappointed, to be honest. Sure, you can’t expect quality tools for this price but this guy got so close. The mistakes that he made with this knife could probably be avoided without adding to the cost. Firstly, the geometry of the blade felt off. It was a bit too thick and wide and the bevels were the wrong shape. This knife won’t go into corners as a sloyd knife is supposed to be able to. Secondly, the handle was very bulky and square. I ended up carving it down quite a bit. I’ll also have to regrind the blade pretty drastically. All this extra work is not worth the money you save by not getting a Mora. Choosing your curved knife is a bit less straight-forward. There’s two options: either you can go cheap and mediocre, or more expensive and difficult to come by, but excellent. The cheap and mediocre option is the Mora 164. This knife is pretty cheap and shouldn’t be too hard to find at your local woodworking store or online. It’s more or less just a bent Mora 106. It comes without a sheath, so you’ll have to make that yourself. Mora makes a couple of other curved knives, such as the 163 and the 162. What sets the 164 apart from these two is that these are sharpened on both sides, while the 164 is only sharpened on one side. The 162 was actually my first curved knife. I bought it without any knowledge of how to carve a spoon. I thought it would be easy to be able to cut both towards myself and away from myself. I did not realize, however, that it is very important to be able to push the back of the blade with your (in my case, being right-handed) left hand. Guiding the blade with the hand that is not holding the knife gives you much more control, and ultimately a cleaner cut. That’s why I would not recomment the 163 or 162. At first glance, the Nic Westermann finishing knife (seen in the illustration at the top of this page) may seem pretty similar to the Mora 164: both are only sharpened on one side, both have a rounder end, which makes them more versatile than knives with a shallower curve. A few characteristics set Nic Westermann’s knife apart from the 164, and make it the best curved knife I’ve ever used: first off, it has a much more sophisticated grind. It is hollow on the inside, which makes it much easier to sharpen, and the outside is one continuous bevel instead of the scandi grind on the Mora. This smooth outside bevel helps to cut across, and even against the grain. The knife has a rounder section at the end, great for deeper bowls, but also a long shallow section, perfect for shallower curves. So in short: it’s great. What are the downsides? It’s nearly three times the cost of the Mora 164, it comes without a sheath and without a handle. If you really are on a tight budget, go for the Mora 164. But if you can afford it, Nic Westermann’s knives are well worth their cost. Do keep in mind that Nic often has a waiting list, so be prepared to wait for the knife. And don’t worry about making a handle for it: it’s easy. The finishing knife comes with a round tang, so just carve something handle-shaped out of ash, oak, or whatever you have; drill a hole at the top and glue the tang in with a bit of epoxy. Job done. To rough out a blank from the log, you need a hatchet. I use a Gränsfors Bruk carving hatchet, which I love. They’re a little over a hundred euros over here, but I’ve seen them for as much as 185 US dollars across the Atlantic. If you can afford it, or can get one for a reasonable price, I’d recommend this one. It’s well worth the money, comes with a good handle and a sheath, and comes razor sharp. It holds a good edge and is exactly the right shape and weight for spoon carving. Keep in mind, though, that this one could be a bit too heavy for you. I’m a big guy and like heavy tools, but I know many carvers who prefer slightly lighter hatchets. I recently tried one of Svante Djärv’s hatchets, which I really liked, and I know Robin Wood also sells some decent hatchets. Before I bought my GB carving hatchet, I used an old sandvik hatchet, a flea market find. It only cost me a couple of bucks, and with a few hours of grinding, sharpening and polishing and a new handle I had a perfectly usable hatchet. I’ve seen lots of great hatchet at flea markets, and if you know how to restore them you can possibly get the perfect spoon carving hatchet for next to nothing. It does require some work, skill, luck and persistence, though. If you’re on a budget, I’d recommend trawling your local flea markets, pawn shops and thrift stores for treasure. I’ve seen many beginning wood carvers starting out with awful camping hatchets from their local DIY store. Nine out of ten times, these are practically unusable for spoon carving. They are often very dull, and the geometry of the bevel is usually far too steep. You could make one of these work, but it would require a complete regrind of the bevel. Oftentimes the grain direction of the handle is way off, and the finish of these tools overall is poor. Of course, there are exceptions, but I haven’t seen them yet. Even if these hatchets are cheap, you’d get bad value for your money. My advice: steer clear. You need a good saw for making stop cuts and cutting pieces of wood to length. The best type of saw for this are Japanese pruning saws. These saws cut on the pull stroke. A lot of spoon carvers use Silky saws, and those are great. They can be a bit expensive, though. I use the Orikomi folding saw 250, coarse. This saw is about half the price of its Silky equivalent, and just as good if you ask me. While it’s not really essential, and not many spoon carvers own or use one, I’d like to briefly discuss one of my favorite tools: the Leuku. This is a large knife, traditionally used by the Sami people of Northern Scandinavia. It’s somewhat similar to a machete, but smaller. In its function it’s almost in between the hatchet and the sloyd knife. I use it for finish hewing, splitting and chopping tasks, and courser carving tasks. It’s more delicate and controllable than the hatchet, but more powerful than the knife. I made my Leuku myself, from a Lauri leuku blank. 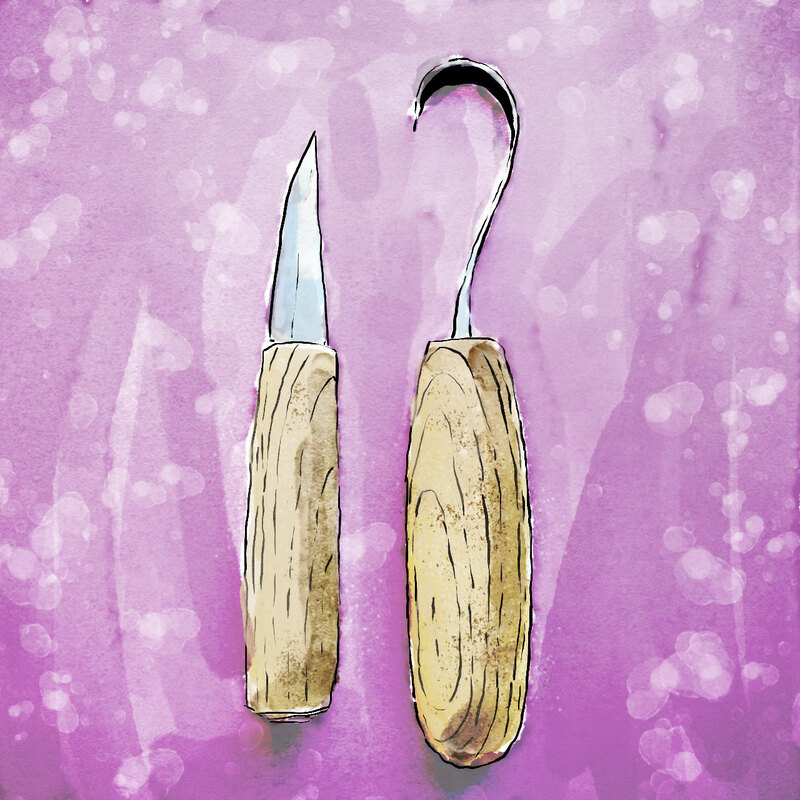 Of course you will also need some other things in your basic spoon carving toolkit, such as a chopping block, and something to keep your tools sharp. Some of these thing you’ll need to buy, but others you can make yourself. I’ll discuss these in an upcoming post. Nicely done! You could have mentioned sharpening too, but overall I think you are spot on. Thanks Ty! I’m actually working on a second blog post about sharpening and stuff you can/should make yourself, such as a chopping block. 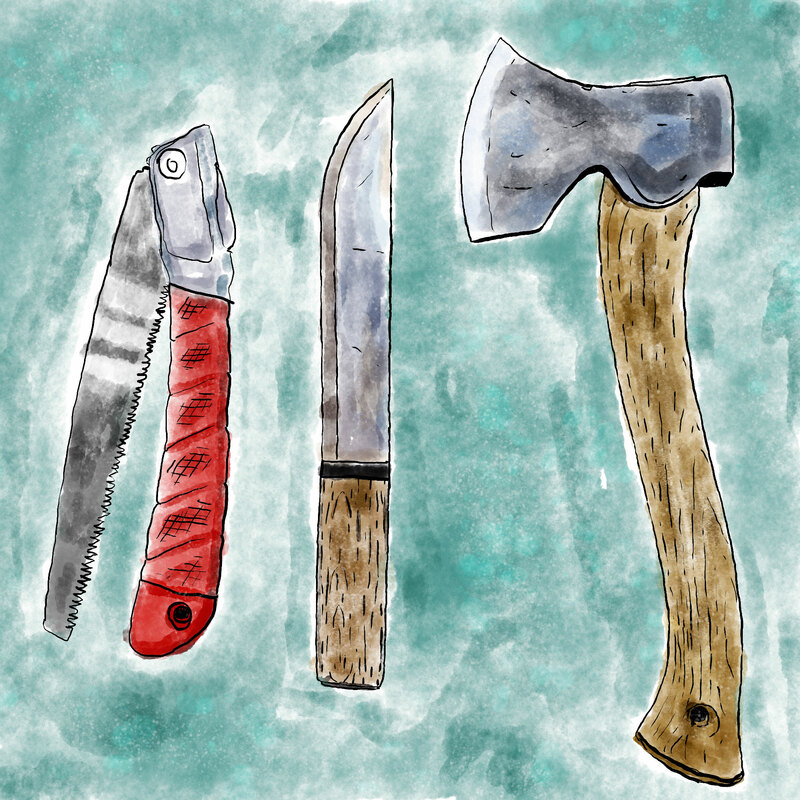 Sharpening is a difficult topic though: so many ways to do it, and so many different factors. Ask ten woodworkers and you’ll get ten different ways to sharpen. Also, if you also do other woodworking or leatherworking or anything like that, it’d make sense to purchase sharpening equipment that you could also use for those tools, if possible. So I’m thinking of a good way to discuss that, but it’ll probably be up in the coming weeks. Can’t fault it. As you I have Mora hook knives and saved up for a Nic W special. The difference was startling, easier to use, easier to sharpen, improved result, 100% as you say. I use two Mora straight knives IIRC 106 & 120. I’d also look at the MacChris and also my favourite, Greenman knives a.k.a. Tim Chilcott make a Sloyd light that has a lovely curved blade (it was made for me and now he sells it and it’s big brother) great steel with differential hardening to protect/reduce the fragility of the curved tip. But your assessment of cost vs benefit is spot on, this was a luxury item. Thanks Julian. Nic makes some amazing knives, really worth the cost. As for the straight knife: of course I don’t mean that you shouldn’t ever buy anything other than a Mora. I’m just saying, just as you say, that anything more expensive than that is just a sidegrade when it comes to functionality. I own some other knives, but they don’t make any better spoons. They are pretty, though.